Director of Teacher Education & SCERT, Odisha, Bhubaneswar is Conducting A Separate Entrance Exam in Every Year for Admission in to Different Teacher Courses. Qualified Candidates will be eligible for Admission in to Different Teacher Course Programmers for the year 2017-2018. 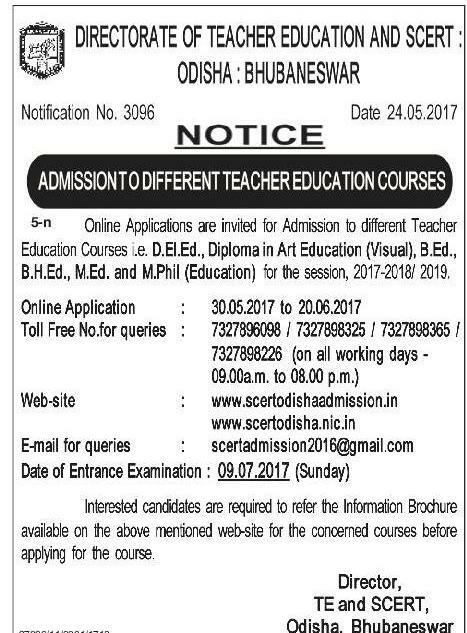 ODISHA D.El.Ed ( C.T ) B.Ed Admission Notice 2017-18 Out. Keep Checking this Site Regularly For Latest Updates. Comments Your Query We will Help you..